Guide them on how to effectively manage teams of professional advisors from multiple disciplines. Introduced to the profession by EPI CEO, Christopher Snider, CEPA, the Value Acceleration Methodology™ is the process taught at the CEPA Program which integrates exit strategy into business, personal, and financial goals of the business owner. 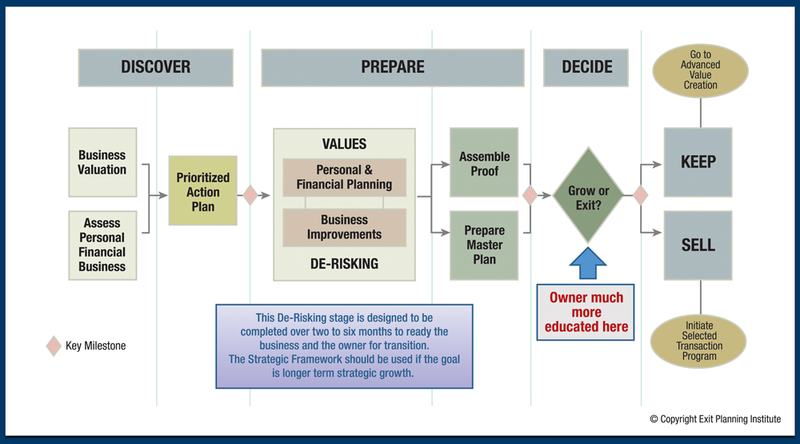 The process consists of three major components, referred to as the “three legs of the stool”: 1) Maximizing business value, 2) Personal financial planning, and 3) Life after business planning. 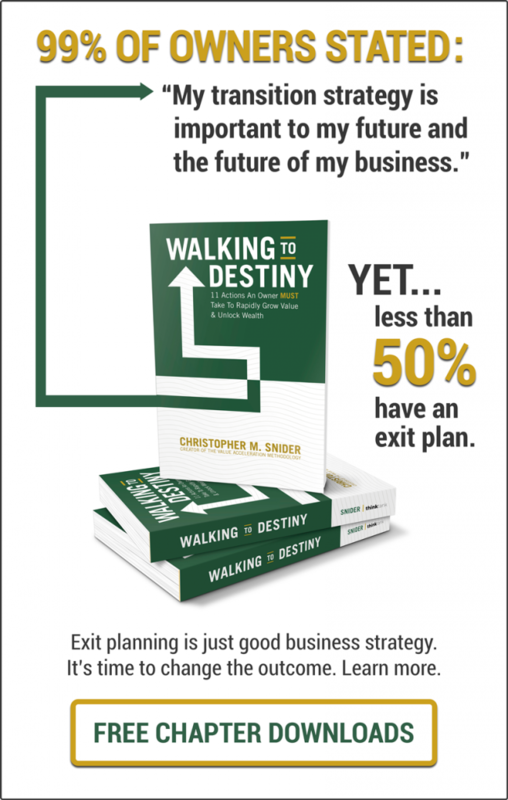 The process teaches that exit strategy is business strategy. The first step in the Value Acceleration Methodology is to identify what value the business currently has and diagnose the transferable value killers within the organization. This enterprise value assessment correlates to a range of value for comparable companies, which provides a baseline measurement of value moving forward. This is needed to produce a prioritized action plan for business planning, tax and estate planning, and personal planning. This discovery phase of Value Acceleration is called the Triggering Event. The Triggering Event correlates a business valuation to a business owner’s personal, financial, and business assessments. All businesses trade in a range of value. Where a business sits in that range of value is based on three factors: (1) the results of financial analysis and benchmarking; (2) an attractiveness score; and (3) a readiness score. Event Time: 8:00 A.M. – 4:30 P.M. The Program Cost is $1,500. Note: This workshop is offered once a year at the Exit Planning Summit. Interested in the Exit Planning Summit? Register now to take advantage of early bird discounts offers. The Mastering the Triggering Event Workshop is offered once a year on the third day of the Exit Planning Summit. The Exit Planning Summit is the “Super Bowl” for Exit Planning Experts, Advisors, and Middle Market Business Owners. It contains the best content taught by top experts in the marketplace. The Summit brings together 200 of the top CEPAs a part of EPI, combined with other leading advisors, thought leaders, and partners within the exit planning space. During this interactive workshop professional advisors will participate in three modules that will: 1) help them better understand how to conduct the enterprise value assessment, 2) teach effective ways to engage business owners and manage engagements, 3) provide a review of the tools and deliverables used, and 4) guide them on how to effectively manage teams of professional advisors from multiple disciplines. Learn effective ways to conduct this interview with the owner while using the enterprise value assessment tool. Learn how to score the owner, ask thought-provoking questions and help the owner navigate through the process. Review the tools and deliverables used during the assessment and learn how to incorporate key philosophies from Mastering the Rockefeller Habits. Learn the project management skills needed to see the engagement through while learning how to: 1) manage a multi-disciplinary team of advisors, 2) manage the client’s expectations, and 3) manage the client’s employees involved in the process. Obtain access to key tools & templates including engagement letters, project templates, planning pyramid, and dashboards & scorecards. Contact Josh Koza for additional details and candidate resources available. This program is available exclusively to CEPA designation holders in good standing. Your membership with the Exit Planning Institute will provide you with powerful member benefits, available only through EPI, including the knowledge, tools, and skills you will need to deliver exemplary exit planning strategies, advice, and support for your clients. Explore your benefits by clicking below.